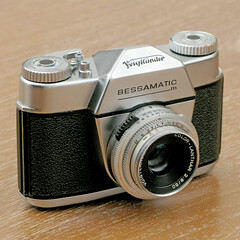 The Bessamatic was launched by Voigtländer in 1959, a few years after the 1953 Contaflex and the 1957 Retina Reflex, all from Germany. This is by far the biggest and heaviest of these three leaf-shuttered SLR cameras, at more than 2 lbs. or 0.935kg. 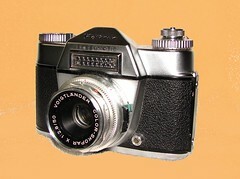 The late arrival on the market had helped Voigtländer improve the ergonomic design taking advantage of previous designs. Nevertheless, it has all the shortcomings found on these cameras, the finder blackout after exposure and the limited range of interchangeable lenses. The Bessamatic is easy to handle and the controls are sound and reliable. The shutter is the behind the lens SLR Synchro-Compur, as found on its fellow competitors, with the EV cross-coupled shutter speed and aperture rings. The viewfinder is bright and the focusing screen has a split image rangefinder, probably the same as found in contemporary Contaflex cameras. The focusing ring is at the front of the lens. The selenium meter cell window is above the lens, in front of the finder prism where it out of the way for light-obstructing fingers. The light meter needle is visible to the right in the viewfinder, as is a follower pointer with a small circle at the tip. They are easily brought to coincide using the large aperture-control knob under the smaller rewind knob. The camera has a sturdy wind-on lever at the right-hand side with a flimsy film reminder in the hub. Next to it is the shutter release and the rewind release lever. At the left-hand side is the rewind knob at top of the large aperture knob. A small lever on the left-hand side of the shutter housing have settings for M and X flash synchronisation, as well as V for self-timer, shifted when a small button is depressed on the opposite side of the shutter housing. The camera back is opened by pushing two small latch buttons against each other using two fingers. The rewind knob is fully extended to load the film cassette. The only quite unusually odd thing about this camera is the frame counter, not the readout itself situated quite conveniently at the back, - below the wind-on lever, but the way in which it is reset. To set it, the film advance sprocket drum, next to the take-up spool, must be turned, using the thumb at the ridged middle part until reaching the desired number. It is difficult, time consuming and not very practical. Otherwise, the interior is beautifully finished and the film easily loaded. The lenses available for the Bessamatic are quite comprehensive, ranging from 35mm to 350mm and are considered as being of superior quality, but rather expensive second hand, since not easily found. The Bessamatic is often associated with the first 35mm zoom lens, the 36 to 82mm f/2.8 Zoomar made by the Zoomar Corporation of USA. In 1962 an improved model, known unofficially as the Bessamatic deluxe was introduced, with all the settings on the lens visible in the viewfinder, externally recognisable by a small protrusion above the selenium meter cell at the front of the pentaprism. More importantly, though, is the addition of a small turning knob next to the wind lever enabling a much easier way to reset the frame counter. One might only wonder why not make it automatic. - The answer is that the counter is not set to zero, but to the number of frames on the film loaded. The 36-frame film is set at a diamond and the 20-frame film at a circle with a dot in the middle on the counter scale, and it counts down, but it does not lock the winding-on at zero. In 1964, a meter-less Bessamatic m was introduced, and finally the Bessamatic CS was produced from 1967 to 1969 with a TTL CdS meter. 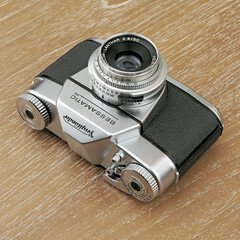 It is an improved Bessamatic Deluxe with the battery compartment occupying the selenium photocell at the front of the finder prism, and an added accessory shoe at the top.